The ADSR production team is back with its latest release Purple Pads, putting a heavy focus on the hybrid blends of Future Bass with R&B and Lo-Fi Chill elements. With over 500MB of content inside of 5 construction kits brimming with soulful leads, pulsing chords, lush pads, lo-fi ambient elements and crisp drum hits make this pack an essential studio tool. Serum fans will enjoy the 33 custom synth presets that can be used in conjunction with the MIDI files to rephrase or add additional layers to sounds. Additional synth presets for Massive have been provided as well as a few bonus sampler instruments for Maschine 2.0, Kontakt 5, EXS 24 and Reason NNXT. 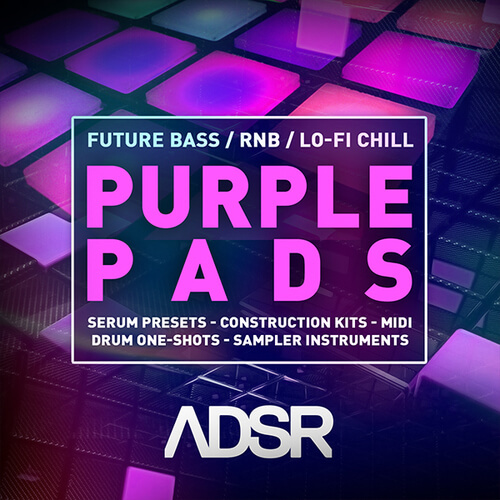 If you’re after the sounds from labels such as Archetype Artists, Buygore, Kannibalen Records, Mad Decent & Future Classic, then Purple Pads from ADSR is just what your next production needs.